Russia’s foreign minister warned yesterday that Ukraine’s NATO ambitions are threatening to derail peace talks in eastern Ukraine. 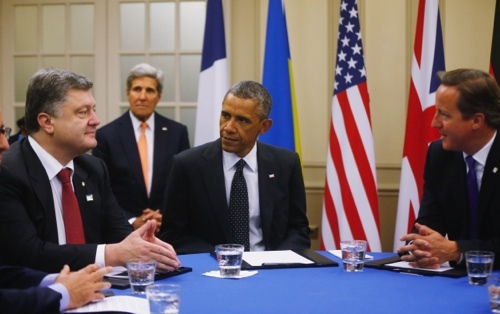 Undeterred, Ukraine’s president began a meeting with U.S. President Barack Obama and other top NATO leaders in Wales. Russia and Ukraine said Wednesday they are working on a deal to halt months of fighting in eastern Ukraine. Russian President Vladimir Putin spelled out a seven-point plan for ending hostilities and expressed hope for a breakthrough at talks in Minsk, Belarus, today. But Foreign Minister Sergey Lavrov said in televised remarks yesterday that statements by senior government officials in Kiev that Ukraine will be seeking to join NATO are “a blatant attempt to derail all the efforts” to seek a peaceful solution in Ukraine. Poroshenko was to meet later in the day with heads of state and government from all 28 NATO member states. NATO officials have made clear that membership for Ukraine isn’t in the cards anytime soon, but the alliance is expected to express solid support for Poroshenko’s government and announce an increase in nonlethal aid for Ukraine’s military. Yesterday morning, NATO Secretary General Anders Fogh Rasmussen accused the Russians of continued meddling in Ukraine despite Putin’s proclamation of a peace plan. Pro-Russian separatists have been fighting government troops in eastern Ukraine since mid-April in a conflict that the U.N. estimates has killed nearly 2,600 people.